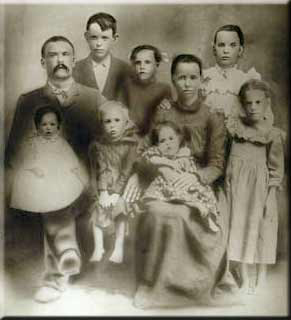 The children are: – Back row, left to right, James Albert, Martha Belle “Mattie”, Nancy Jane. Front row, child on John’ knee is my father Barney Vinyard, Robert Franklin “Frank”, Sarah Elizabeth on Margaret Matilda’s lap and Mary Ann Lawson. This is a picture of my Grandparents, John Vinyard and Margaret Matilda “Tilda” (Henson) Lawson. John was the oldest son of Albert G. and Nancy (Randolph) Lawson and was born 30 January 1870 in Pleasant Grove Area, Walker County, Alabama and died 16 November 1932 in Norwood Hospital, Birmingham, Jefferson County, Alabama. Tilda was born 7 October 1867 in Walker County, Alabama and died 23 April 1950 in Carbon Hill, Walker County, Alabama. 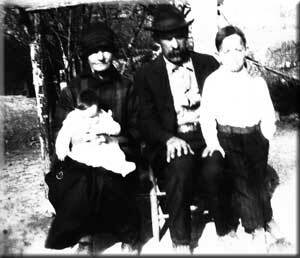 The picture was taken about 1902 or 1903 and had all the children of the family except my father Barney V. Lawson, because he was not born yet. After his birth, they had the picture touched up by taking a picture of Barney and placing him on my Grandfather knee so they would have the complete family. 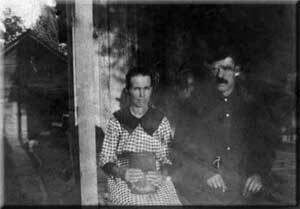 This picture was taken of John and Tilda sitting on the front porch of their house in Springhill, Walker County, Alabama. All of their children were born in this home and all but 2 of my brother and sisters were born in this house. John and Tilda having a picture taken with two of their grandchildren. The baby is my sister Margie Jean and the young boy is my brother James Vinyard Lawson. The picture was taken shortly before John death.